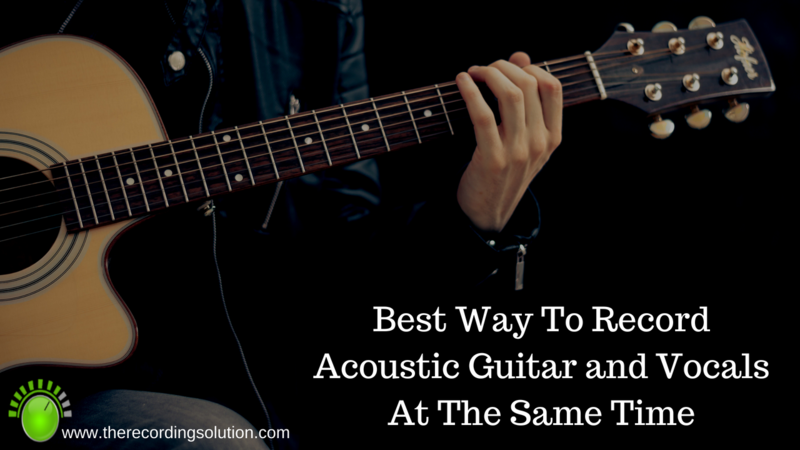 If you're searching for the best way to record acoustic guitar and vocals at the same time, then you need to think about how certain microphones record sound. Specifically the polar patterns of the microphones. If you are recording a vocal and acoustic guitar at the same time with 2 mics, you want to pick 2 mics that will focus mainly on what you put them in front of, and for the most part reject other sound sources that are around them. In this video I show you how to use a cardioid dynamic sm57 mic on the vocals that has a polar pattern that mainly picks up only the vocalist that it is pointed at. It rejects most of the guitar that is being played at the same time. I also show you how I use a cardioid condenser mic (audio-technica 2020) on the acoustic guitar which is angled in a way to mostly record the acoustic guitar and reject a lot of the vocal that is being sung at the same time. The best way to record acoustic guitar and vocals is to start here like I show you, and then move the mics around, record a little, listen back, and then decide if you need to adjust. Setting up a mic(s) recording, listening back, and then adjusting is how you should approach recording ALL your instruments. Each studio and rooms that we all have access to record in all react differently, so there is really no "best" way to record. Experimentation is the best way to learn. Using this 2 mic technique, you can capture a nice performance of a vocal and acoustic guitar at the same time.